Dean Caswell was born on July 24, 1922, in Banning, California. He enlisted in the Aviation Cadet Program of the U.S. Navy in September 1942, and was commissioned a 2d Lt in the U.S. Marine Corps and designated a Naval Aviator on December 16, 1943, at NAS Pensacola, Florida. After completing additional training, Lt Caswell served as an F4U Corsair pilot with VMF-221 at Santa Barbara, California, from April 1944 to January 1945, and then deployed aboard the aircraft carrier USS Bunker Hill (CV-17) in the Pacific Theater from January to June 1945. During this time he was credited with the destruction of 7 enemy aircraft in aerial combat, plus 1 probable. He then served as an F4U pilot with VMF-451 at MCAS El Centro, California, from June 1945 until he left active duty in November 1945. Captain Caswell returned to active duty in the Marine Corps in July 1946, and served at NAS Quonset Point, Rhode Island, and MCAS Cherry Point, North Carolina, before attending All Weather Flight Training from September 1946 to February 1947. His next assignment was with VMF-461 at Cherry Point from February 1947 to April 1949, and then with SMS-11 at Cherry Point from April to August 1949. 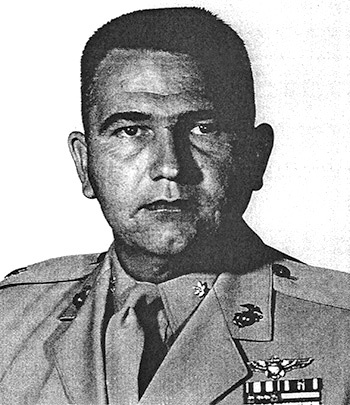 Captain Caswell attended additional training from August 1949 to July 1950, and then served with VMT-2 at MCAS El Toro, California, from August 1950 to April 1951. His next assignment was as an F3D Skyknight pilot with VMF(N)-542 at MCAS El Toro from April 1951 to May 1952, and then with VMF(N)-513 in Korea from June to October 1952. He remained in Korea with VMC-1 from October 1952 to February 1953, and then returned to the United States, serving at MCAS El Toro from February to December 1953. Major Caswell next served as a flight instructor and on the staff at NAS Corpus Christi, Texas, from January 1954 to March 1957, followed by service with MABS-31 at MCAS Miami, Florida, from April to October 1957. He served as a staff officer at MCAS Miami from October 1957 to October 1958, and then as Executive Officer of MACS-8 at MCRD Parris Island, South Carolina, from November 1958 to December 1959, and then deployed with the squadron to NS Cubic Point in the Philippines from February to September 1960. He served with Headquarters and Maintenance Squadron 11 from October 1960 to May 1961, followed by service as Commanding Officer of Marine Aviation Detachment at NAS Memphis, Tennessee, from July 1961 to July 1963. Lt Col Caswell attended Armed Forces Staff College at Norfolk, Virginia, from August 1963 to January 1964, and then served as Commanding Officer of MACS-6 at MCAS Beaufort, South Carolina, from January to December 1964. His next assignment was as Commanding Officer of VMF-333 at MCAS Beaufort from December 1964 to August 1965, followed by service as Executive Officer of MAG-32 at MCAS Beaufort from September 1965 to April 1966. Colonel Caswell's final assignment was as Commanding Officer of Headquarters and Service Battalion at MCRD Parris Island, South Carolina, from April 1966 until his retirement from the Marine Corps on December 31, 1968. For distinguishing himself conspicuously by gallantry and intrepidity in action while participating in an aerial flight in operations against the enemy in the vicinity of Okinawa on 28 April 1945. While flying as a member of a six plane flight of carrier based fighter planes on combat air patrol over friendly ships in the vicinity of Okinawa, he and the pilots accompanying him sighted a formation of approximately thirty enemy fighters as they were approaching Okinawa to launch an attack on shipping and land installations. Although heavily outnumbered by the enemy, he and his flight unhesitatingly pressed home an attack on the enemy that resulted in the destruction of fourteen enemy planes and the probably destruction of one. He personally shot down three enemy planes and probably destroyed one. The enemy formation was scattered and the remaining planes headed back without delivering their attack. His extraordinarily aggressive spirit and courage in attacking superior numbers of the enemy and his skillful airmanship in shooting down three enemy planes and probably accounting for another contributed materially to the safety of our ships and land installations. 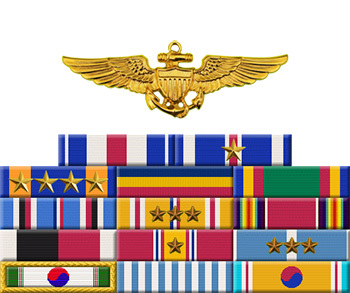 His conduct throughout was inspiring and in keeping with the highest traditions of the United States Naval Service.